SXSW EDU opening keynote with David Brooks, Dan Porterfield, Darius Baxter, and Rev. Lisa Fitzpatrick announced alongside new featured speakers Dan Rather, Jamaal Charles, Priscilla Chan, Jean Chatzy, Mitchell Baker, and more. These thought leaders offer a perspective on everything from learning science and financial literacy to student advocacy and inclusion. This year’s opening keynote, Building Community: Weaving America’s Social Fabric, features remarks by David Brooks, Executive Director of Weave: The Social Fabric Project at the Aspen Institute and Op-Ed columnist for The New York Times, who will be joined by Aspen Institute President and CEO Dan Porterfield, GOODProjects President and Chief Engagement Officer Darius Baxter, Aspen Institute Executive Director David Brooks, and Rev. Lisa Fitzpatrick the Co-Founder and Executive Director of APEX Community Advancement, Inc. / APEX Youth Center and Senior Pastor of APEX Ministries United Methodist Church. Weave: The Social Fabric Project, an initiative of the Aspen Institute, operates with the premise that social fragmentation is the central problem of our time—isolation, alienation, and division. Fortunately, all across the country people are rebuilding communities and creating social capital. Weave seeks to work with these groups to spur a movement to repair the national fabric—to identify and celebrate these groups, synthesize the values that move them, and help forge a common identity. Betsy Corcoran – (Translating Research into Practice) Elizabeth “Betsy” Corcoran is co-founder and CEO of EdSurge, an award-winning news and information site on education technology that is devoted to exploring the future of learning. Brooke Stafford-Brizard – (Translating Research into Practice) Dr. Brooke Stafford-Brizard is a Director of Education at the Chan Zuckerberg Initiative, where she leads work to support a comprehensive, Whole Child approach to learning and development. Bror Saxberg – (Translating Research into Practice) Dr. Bror Saxberg leads Chan Zuckerberg Initiative’s work to support the development of tools and sharing of approaches grounded in the science of learning as Vice President of Learning Science. Dan Rather – (Young People Win: Rethinking Advocacy in a New Era) With a famed and storied career that has spanned more than six decades, Dan Rather has earned his place as one of the world’s best-known journalists. Drew Willis – (How to Teach Financial Literacy, & Why We Must) Drew Willis is the Creative Director of TIME for Kids, TIME Edge, and Your $, TFK’s financial-literacy magazine. Erika Guerrero – (A Unified Perspective) Special Education Teacher at Alamo Heights High School is an advocate and support system for individuals with disabilities as both a foster parent and an educator. Jamaal Charles – (A Unified Perspective) Retired NFL running back, Jamaal Charles, excelled as a child in sports getting his first introduction to sports as a Special Olympics Athlete and then as a teenager. Jean Chatzky – (How to Teach Financial Literacy, & Why We Must) Jean Chatzky, the financial editor of NBC’s TODAY show and AARP’s personal finance ambassador, is an award-winning personal finance journalist and founder and CEO of HerMoney. Mitchell Baker – (Hacking the STEM Syllabus) Mitchell Baker co-founded the Mozilla Project to support the open, innovative web and ensure it continues offering opportunities for everyone. Priscilla Chan – (Translating Research into Practice) Priscilla Chan is co-founder of the Chan Zuckerberg Initiative (CZI), a philanthropic organization she started with her husband, Mark Zuckerberg, in December 2015. Tajha Ilerant – (A Unified Perspective) Tajha is a senior at Immokalee High School in Immokalee, Florida where she is Youth Ambassador for Unified Champion Schools as well as a Global Messenger for Special Olympics Florida. Yoav Schlesinger – (Hacking the STEM Syllabus) Principal for the Tech and Society Solutions Lab at Omidyar Network, Yoav Schlesinger, is focused on building long-term resiliency and maximizing the tech sector’s contributions to society. 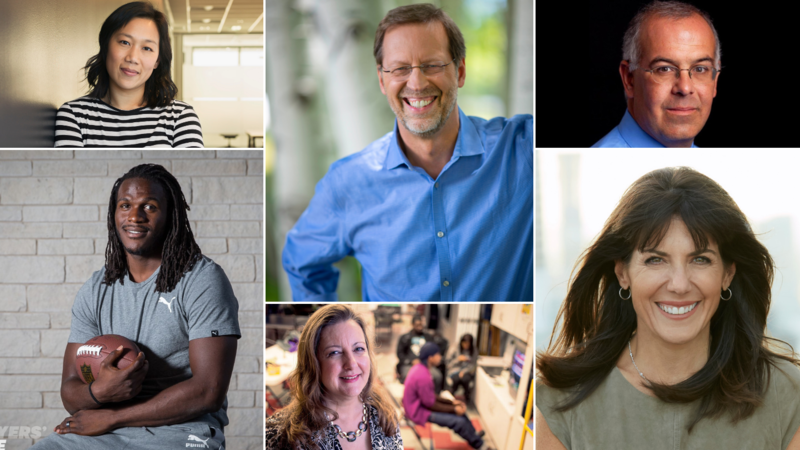 SXSW EDU will feature more than 1,200 world-class speakers – including educators, researchers, activists, entrepreneurs, artists, policy and business leaders, March 4-7, 2019. Lock in your plans to attend through Friday, February 15 to save $50 off the walk-up rate. Photo (l-r, t-b) Priscilla Chan, Dan Porterfield, David Brooks, Jamaal Charles, Rev. Lisa Fitzpatrick, and Jean Chatzy.